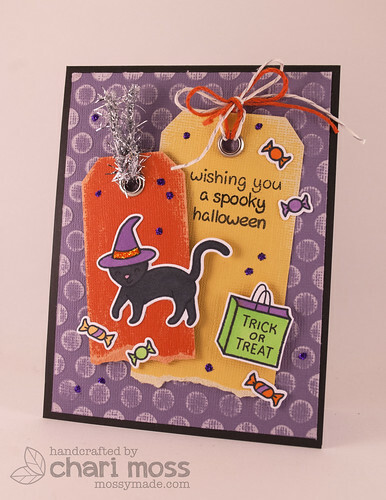 Hello, this week the Lawn Fawn team is playing with some awesome Core'dinations goodies. Big thanks to Core'dinations for sending us lots of fun product to play with. For my card I used some purple from the Graphic 45 Lights collection and dry embossed it with an embossing folder. Then I used the Sand It Gadget to distress the raised dot pattern. I also used a few tags from the Core'dinations Bright assorted tags set to create the background for my images. I tore the bottom edge of each tag and distressed the edges with the Sand It Gadget as well. I used some Tim Holtz tinsel twine in silver and orange and silver sparkle Lawn Trimmings twine to decorate my tags. Great design and texture and everything else! Love it. I don't remember when we all started using purple for halloween, but I LOVE it. Great texture, and great card.